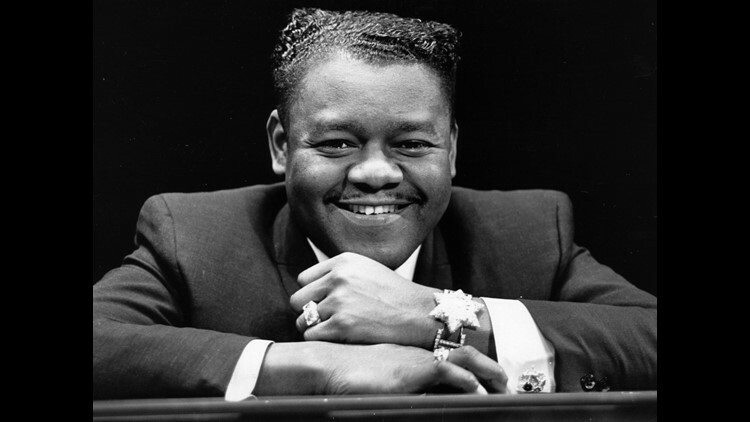 Legendary American jazz pianist and singer Fats Domino (Antoine Domino) died at 89 on Oct. 24, 2017. He shaped rock and roll with songs like Blueberry Hill, The Fat Man, Ain't That a Shame and I'm Walkin' (Photo: Express Newspapers/Getty Images). Fats Domino's 1957 classic song "I'm Walkin'" is one of 25 recordings being inducted into the Grammy Hall of Fame. The Recording Academy announced its newest inductees on Thursday. "I'm Walkin'," written by Dave Bartholomew and recorded by Domino on Imperial Records, is the fifth Domino-Bartholomew song to be included in the Grammy Hall of Fame. Others are "Blueberry Hill," "Ain't It A Shame," "Walking to New Orleans" and "The Fat Man," which marked Domino's recording debut. In order to be included, songs or albums must be at least 25 years old and "exhibit qualitative or historical significance." Songs are reviewed by a committee, with final approval by the Recording Academy's National Board of Trustees. Other songs inducted this year include Aerosmith's "Walk This Way," Brenda Lee's "Rockin' Around the Christmas Tree," Dolly Parton's "Coat of Many Colors" and The Platters' "Smoke Gets in Your Eyes." Other inductees include Ella Fitzgerald, Leonard Bernstein, Nina Simone, Tom Petty, Leonard Cohen and Miles Davis. The Hall of Fame, now in its 46th year, currently totals 1,088 recordings and is on display at the Grammy Museum. Previous New Orleans and Louisiana additions to the list include Louis Armstrong (for several songs and albums), Professor Longhair ("Tipitina"), the Meters ("Cissy Strut"), Aaron Neville ("Tell It Like It Is"), the Original Dixieland Jazz Band, Mahalia Jackson and former Gov. Jimmie Davis ("You Are My Sunshine").